TH E M R EP O RT | 51 SPECIAL ADVERTISING SECTION Red Bell Real estate, llc KEY PERSONNEL Jeff Jonas President Craig Lasson SVP, Business Development CONTACT INFORMATION 7730 South Union Park Ave., Suite 400, Midvale, UT 84047 Email: MoreInfo@RedBellre.com Website: RedBellre.com CORPORATE PROFILE Red Bell is an innovative real estate brokerage and technology company that delivers an array of brokerage services as well as pricing and valuation products to investors, lenders, and loan servicers. Licensed in all 50 states and the District of Columbia, Red Bell assists clients to better understand and capitalize on local markets through its use of near real-time data from nearly 400 MLSs. 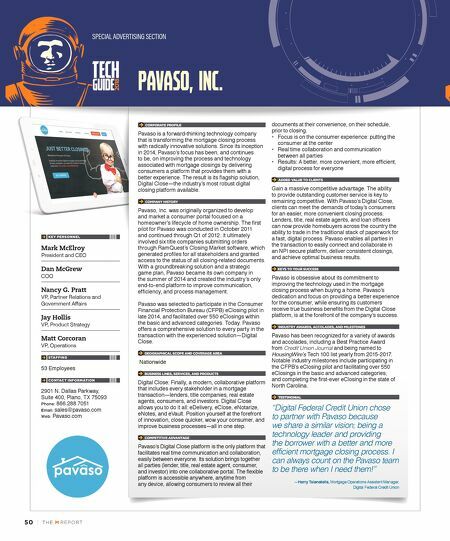 End-user Categories Lender/servicer Outsourcer BUSINESS LINES, SERVICES, AND PRODUCTS Automated Valuation Estimator (AVE): AVE is a pricing tool allowing sellers and buyers to select the best comparables and provide supporting prices in a user-friendly environment. It includes instant access to interior photos, listing histories for subject property comparables, and valuable trending analytics. Also used for rental analysis, AVE assists in boosting investor confidence through its automated analysis of the extensive property listings without having to weed through thousands of properties manually. Asset Watch: Asset Watch allows users to monitor an existing portfolio proactively. It sends daily notifications of any new listings on an MLS or changes on properties listed. Benefits include: • Customer Retention: Provides an opportunity for a lender/loan officer to reach out to their customer before they sell the property to see if the customer needs help with a new loan on a property they are purchasing and retain servicing of good customers. • Servicing/Default Management: Provides owners/servicers with updates on defaulted loans to see if the property is listed for sale. • REO Management: Provides monitoring on the listing activity to ensure the property is listed accurately and on time. • Portfolio Monitoring: Better understand pre- pay speeds and portfolio execution. Anticipate potential losses or servicing performance issues. Broker Price Opinion (BPO): When you combine a network of over 20,000 agents, live reporting, and QC done on ALL orders, you get the finest BPO in the industry. Valuation Risk Review (VRR): The most cost- effective way to ensure that an appraisal is based off the best comparables is through a VRR. The VRR reviews a completed appraisal using Red Bell's AVE listings. Appraisal Reconciled BPO (ARBPO): Get two products for the price of one. The ARBPO starts with a Broker Price Opinion which is then reconciled by a licensed appraiser. 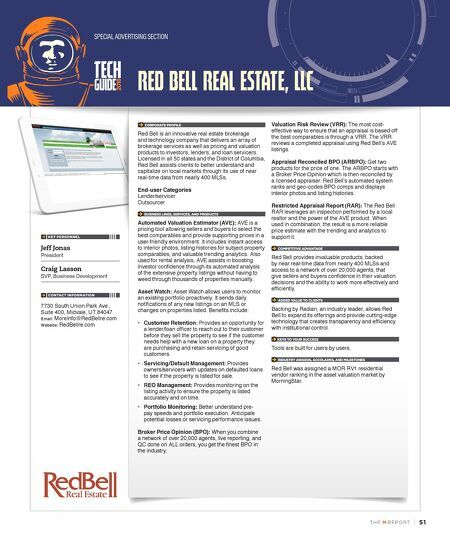 Red Bell's automated system ranks and geo-codes BPO comps and displays interior photos and listing histories. Restricted Appraisal Report (RAR): The Red Bell RAR leverages an inspection performed by a local realtor and the power of the AVE product. When used in combination, the result is a more reliable price estimate with the trending and analytics to support it. COMPETITIVE ADVANTAGE Red Bell provides invaluable products, backed by near real-time data from nearly 400 MLSs and access to a network of over 20,000 agents, that give sellers and buyers confidence in their valuation decisions and the ability to work more effectively and efficiently. ADDED VALUE TO CLIENTS Backing by Radian, an industry leader, allows Red Bell to expand its offerings and provide cutting-edge technology that creates transparency and efficiency with institutional control. KEYS TO YOUR SUCCESS Tools are built for users by users. INDUSTRY AWARDS, ACCOLADES, AND MILESTONES Red Bell was assigned a MOR RV1 residential vendor ranking in the asset valuation market by MorningStar.